There are 20 things to avoid to become a real lady. Some people consider the rules of etiquette to be outdated and old fashioned. However, good manners never go out of style. If you want to be taken seriously! You should know there are things that can ruin your image of a true lady. We have come up with a list of typical etiquette mistakes a lady would never make keep them in mind and you'll always make a great first impression. #20. Wearing poor quality fake designer items. You don't have to spend all your money on some ridiculously expensive designer bag but if you can't afford it buying a much cheaper copy is not an option. A replica even of good quality can be easily spotted. So, if you plan to ruin a good first impression go for the fake. If not choose stylish and high quality clothing items that you can afford. They don't have to have some famous designers name on them. The same applies to accessories and jewelry. Another advantage of this approach is that clothes of good quality lasts long. So buying them you save money and time you would otherwise have to waste on shopping in the future. A true lady would never wear an oversized sweater or a pair of overly tight shorts. She knows how to choose the right types of clothes that say a lot about her style. She would never wear baggy clothes just because they're comfortable. Her clothing is very tasteful, feminine, and every item in her wardrobe is chosen according to her body type. As for accessories they should be modest and not cheap. If you are choosing earrings, go for diamond or pearl studs. Evening dress will look perfect complemented with dangling earrings. It is a good idea to use brooches pinned to your jacket, sweater, or blouse. They give any piece of clothing an individual look. Another important rule for a lady is holding a royal posture. Improving your posture is not as difficult as it may seem at first. Including regular exercises in your schedule will strengthen the muscles in your upper back and shoulders and improve your posture. Especially effective is yoga. What is more, it is a very ladylike kind of exercise. #17. Not taking good care of yourself. A true lady takes good care of herself. She loves sports, maintains a healthy diet, pays attention to skincare, and consult specialists if necessary. This means she is fit and has glowing skin and healthy hair and nails. It doesn't mean that to look perfect; you need to spend long hours in beauty salons or Fitness plugs. You just need to look neat, presentable, and well groomed at any moment of your life. Be it at home or work. #16. Wearing too much makeup. If a woman pays special attention to skin care, her skin looks amazing. She knows exactly what makes her face stand out and uses makeup accordingly. She is always in the spotlight and she looks gorgeous even without tons of decorations on her face. An ideal choice for makeup is a light foundation, some blush, mascara, and lip gloss. A true lady knows how to take control of her nervous habit- If she has any. She'd never play with her hair, shake her leg, or let any other fidgety behavior ruin her reputation. What is more, small things are not worth bussing over. As they say: "if you can't change anything, there is no sense in worrying". You can change something there is no need to worry. Don't hurry; you can lose your face. Aa true lady manages to find time for everything. So, take your time. To get the last spoonful of soup, you need to slightly tilt your bowl or soup plate. Although table manners say you should tilt the plate away from you to avoid splashing, it's better not to finish the soup at all. Even if your soup is mind-blowingly delicious, enjoy it until you can use your spoon without tilting the plate. Another tip is to use not the familiar for most people's tapered end of the spoon. but its sides. This way there's a much smaller chance of accidentally spilling it. #13. Being rude and spreading rumors. Being rude, gossiping and whining are tattoos for a true lady. It's beneath her. Neither would she listen to someone else's whining and gossiping. Why spend her precious time on that? #12. Talking and laughing loudly. It's very important to watch the tone of your voice. Laughing loudly, yelling, and offensive language are unacceptable. Don't matter if it's your grandmother, your three-year-old, or a president. Take the same tone of voice with everyone. There is an opinion that a loud voice equals confidence in yourself but, in fact, it is nothing but in politeness. A true lady always has her own opinion and she's 100% sure of it. However, she never forced her ideas on anybody nor would she argue her choice. Doing so often indicates a person, unsure of themselves. It is crucially important for them to prove to the world that they are correct. A lady doesn't need it at home. When all is said and done. Why bother to prove her position? #10. Eating on the go. Etiquette rules say you need to use cutlery when you're at the table. So even if pizza is your favourite food, don't order it in a restaurant. If you're in a hurry, try not to eat on the go. It doesn't suit a true lady. The best idea is to rearrange your tight schedule to find a couple of minutes for at least a decent cup of coffee. Opening up to a stranger has nothing to do with the image of a lady. Aa true lady is never too much when it comes to communicating with new people. She doesn't share details of her personal life, her job, or her innermost thoughts. #8. Wearing white high heels. integrate the shoes into your outfit. In other cases, choose 2-tone or beige high heels. Depending on the color of your ensemble other colors can work too. But you can never go wrong with a pair of black pumps. A lady knows that it's unacceptable to be more than 15 minutes late both for business and personal meetings. And if the event is a wedding graduation or funeral it is absolutely unacceptable to be late. A lady, herself, wouldn't wait for longer she'd leave because she values her time. #6. Leaving an umbrella open to dry. It's a very common mistake. Don't leave your umbrella open to dry. Close your umbrella before entering a building, shake the water off, and hang it to dry. You can also use a special drying machine if it's available. Also be very attentive not to put a wet umbrella on a seat. You wouldn't want to be the one to sit in a puddle of water, right? #5. Responding to another person sneeze by saying "bless you." Many people respond to someone else's needs by saying "bless you," but this is only acceptable if the sneezer is a close friend or family member. In all of the cases, just ignore it as if you didn't notice anything unusual. According to modern business etiquette rules, a woman must wear pantyhose to work in formal receptions. Even on the hottest summer day. If it's too hot, you can wear thigh-highs or pants instead of a dress or a skirt. #3. Refusing food or drinks offered by a host. 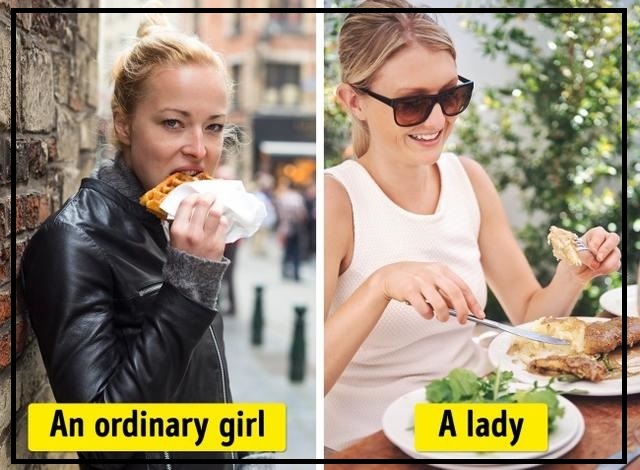 A true lady would never refuse food and drinks offered to her. If a host asked what drinks she prefers, a lady would thank the host and go with a glass of white without lengthy explanations as to why she can't have a drink. It's okay not to eat it all and just to take a sip of wine. #2. Dancing with your hair down. Remember to keep your hair up and never wear high wheels so as not to injure other dancers. Aa true lady cares about other people's health and safety. What is more, there is one golden rule: better not to dance at all than to dance badly. #1. Ging on your food to cool it down. It's unacceptable to blow on your food, which is why a true lady waits for it to cool down naturally. The best way to do it is to take a spoonful of your dish and hold it while you support the conversation. This way the food will cool off quickly and effectively. Another way to make your food fool down is to try to stir it with a spoon. However, some etiquette gurus consider this method improper. What other etiquette rules do you follow? Write to us in the comments. We will be happy to know your opinion. Share this article with those of your friends who have always been dreaming of becoming a lady but didn't know how!